Taking it back to where it all began. A timeless classic with new features, pull on these Ray-Ban 2132 902 New Wayfarer Classic Sunglassess in Tortoise. 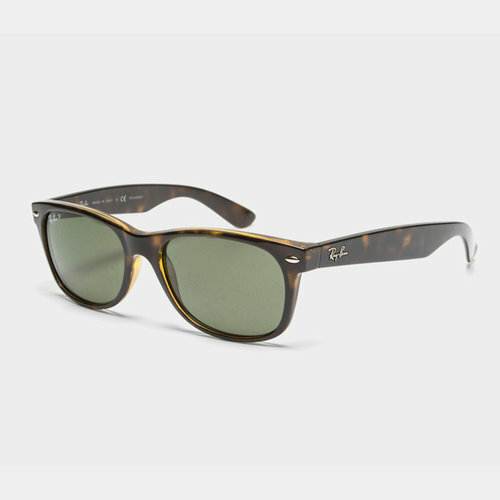 These Ray-Ban sunglasses have kept the same essence and design of the original Wayfarer, but reduced the frame size and created a softer eye shape. Fitted with green classic lenses, you can expect a guarantee of 100% UV protection along with ultra clear vision. Smartly presented with a tortoise shell frame with a perfect finish, these Ray-Ban sunglasses come complete with their own stylish carrying case so you can be prepared for any occasion, indoors or outdoors. Still, as much of a classic design today as it was in 1952, pull on today's design with the Ray-Ban 2132 902 New Wayfarer Classic Sunglasses.